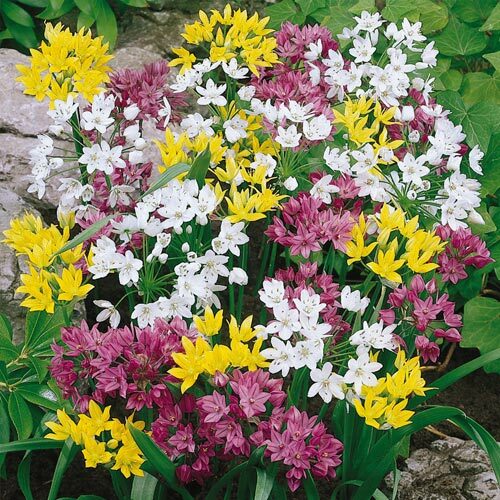 Hundreds of small, fragrant flowers in shades of pink, white and yellow open in late spring. Fully hardy and easy to grow in any well-drained soil. Bulbs naturalize freely. Carefree and rewarding! Alliums offer a wide diversity of color, height, and blooming times. They will tolerate poor garden soil; once established, they will naturalize easily. Alliums are deer resistant and make excellent cut flowers. Bloom Time Late spring to early summer. None, let foliage die back naturally to store up energy to produce next year's blooms.